There are many fun facts about cats. For example, did you know that people who love felines are called "ailurophiles"? Cat fanciers of all ages can proudly claim this title. Cats have been beloved pets since at least 5500 B.C. They were worshipped as gods by the Egyptians. 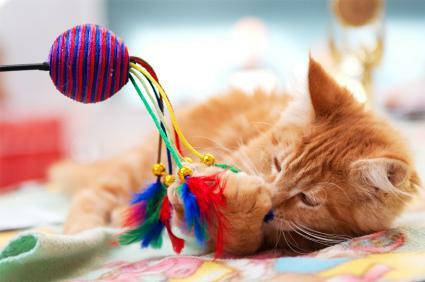 Most cats will spend nearly eight hours, or a third of the day, grooming themselves. Cat's tongues are covered with spikes that face backwards. These spikes help to clean and comb the cat's fur. Kittens begin to purr at about one week of age. They do this in response to the mother's purr. A cat can sprint at about 31 miles per hour. Ready for more fun facts about cats? Sir Isaac Newton is credited with inventing the cat door. He was just one of many feline fanciers in history. Florence Nightingale was said to have owned 60 cats in her lifetime! Researchers tried to develop a mouse-flavored cat food, but the cats tested refused to eat it. The research was stopped, and the company went back to chicken, beef and turkey. Cats use their tails as a counterbalance. It helps them walk along narrow fences and other areas. Cats also communicate with their tails. A cat's sense of smell is fourteen times as keen as that of a human. Cats sense smells with something called the Jacobsen's Organ which is located on the roof of their mouths. For more info on this fun fact, check out Smells that Cats Hate.